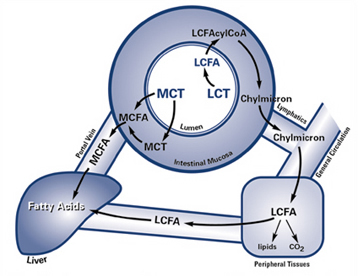 Medium-chain triglycerides (MCTs) are a special class of fatty acids. 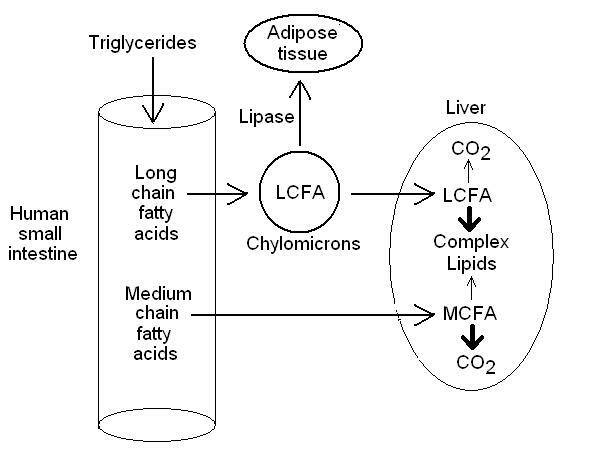 Normal fats and oils contain long-chain fatty acids (LCTs). Compared to these fatty acids, MCTs are much shorter in length. Therefore, they resemble carbohydrates more than fat. As a result, they are more easily absorbed, digested, and utilized as energy than LCTs. Medium-chain triglycerides are found naturally in milk fat, palm oil, and coconut oil. 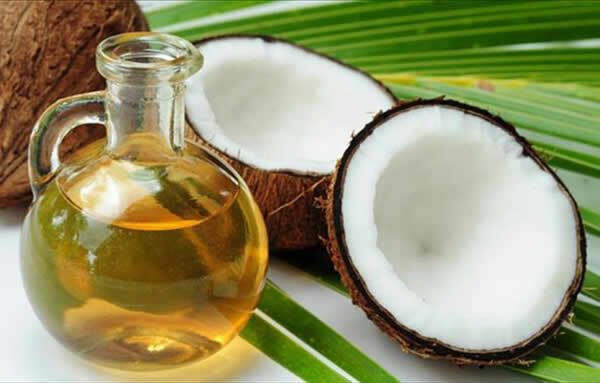 Commercial MCT oil, available as liquid and capsules, is obtained through lipid fractionation, the process in which MCTs are separated from other components of coconut oil. Medium-chain triglycerides were originally formulated in the 1950s as an alternative food source for patients who are too ill to properly digest normal fats and oils. The long chains of LCTs require a lot of bile acids and many digestive steps to be broken down into smaller units that can be absorbed into the bloodstream. Once in the bloodstream, they are absorbed by fat cells and stored as body fat. In contrast, the medium-chain triglycerides are more water-soluble and are able to enter the bloodstream quicker because of their shorter lengths. Once in the bloodstream, they are transported directly into the liver. Thus, MCTs are an immediately available source of energy and only a tiny percent is converted into body fat. Medium-chain triglycerides were first used in the mid-1900s to reduce seizures with the help of the ketogenic diet. In the 1980s, MCTs became popular in sports as a substitute for normal dietary fats or oils. They quickly became a favorite energy source for many athletes, such as marathon runners, who participate in endurance sports. These athletes require a quick source of energy, which is readily supplied by carbohydrates. However, diets high in carbohydrates may cause rapid increase in insulin production, resulting in substantial weight gain, diabetes, and other health problems. Dietary fats or oils are not a readily available source of energy. In addition, they are believed to make the body fatter. MCT is also a form of fat; therefore, it is high in calories. Yet, unlike normal fats and oils, MCTs do not cause weight gain because they stimulate thermogenesis (the process in which the body generates energy, or heat, by increasing its normal metabolic, fat-burning rate). A thermogenic diet, which is high in medium-chain triglycerides, has been proposed as a type of weight loss regime. Medium-chain triglycerides are often used by athletes to increase their endurance during sports or exercise regimes. MCTs are an immediate source of energy, and as such, the body can use them as an alternative energy source for muscle during endurance exercise. However, if consumed in moderate amounts (30 to 45 grams), MCTs are not very effective in either decreasing carbohydrate needs or in enhancing exercise endurance. Increased consumption may help. One study evaluated six athletes at different points during a 25-mile cycling trial. They were given either a medium-chain triglyceride beverage, a carbohydrate drink, or a combined MCT-carbohydrate mixture. The fastest speed was achieved when the athletes used the MCT-carbohydrate blend. The worst performance was associated with sport drinks containing MCT alone (without carbohydrate). Therefore, to gain significant increases in endurance, it is generally recommended that an athlete consume at least 50 grams of MCTs per day in combination with some carbohydrates. However, dosages exceeding 30 grams often cause gastrointestinal upset, which can diminish an athlete’s performance. MCT products available in the market may have high water content or contain unwanted ingredients. Therefore, athletes should buy MCT-only products, and mix a small amount into carbohydrate soft drinks. Alternatively, they can purchase premixed MCT sport drinks. MCTs are popular among body builders because they help reduce carbohydrate intake, while allowing them ready access to energy whenever they need it. MCTs also have muscle-sparing effects. As a result, they can build muscles while reducing fats. However, this does not mean that these athletes will become healthier, because an improvement in body physique does not always correlate with higher fitness levels. Compared to carbohydrates, medium-chain triglycerides are a better and more efficient source of quick energy. They help conserve lean body mass because they prevent muscle proteins from being used as energy. Therefore, some athletes load up on medium-chain triglycerides the night before a competition. However, MCT intake should be raised gradually to allow the body to adapt to increasing MCT consumption. If MCT consumption abruptly increases, incomplete MCT metabolism may occur, producing lactic acid in the body and a rapid rise of ketones in the blood, which can make the person ill.
Studies have shown that MCT may increase metabolism, which is the rate that the body burns fat. It is believed that sustained increases in metabolic rate cause the body to burn more fat, resulting in weight loss. However, for any kind of meaningful weight loss, a person would have to consume more than 50% of total daily caloric intake in the form of medium-chain triglycerides. A ketogenic diet, or diet containing mostly medium-chain triglycerides, offers hope for those who have seizures that cannot be controlled by currently available drugs. Excessive consumption of MCTs produces ketones in the body; therefore, this type of diet is called a ketogenic diet. It has proven effective for some epileptic patients. MCTs are the preferred forms of fat for many patients with fat malabsorption problems. Many diseases cause poor fat absorption. For instance, patients with pancreatic insufficiency do not have enough pancreatic enzymes to break down LCTs. In children with cystic fibrosis, thick mucus blocks the enzymes that assist in digestion. Another fat absorption condition is short-bowel syndrome, in which parts of the bowel have been removed due to disease. Stressed or critically ill patients also have a decreased ability to digest LCTs. Unlike LCTs, medium-chain triglycerides are easily absorbed by patients with malabsorption conditions. These patients benefit most from oral preparations that contain MCTs as the primary source of fat (up to 85% of fat caloric intake). Several scientific studies have shown MCT to be effective in treating fat malabsorbtion, chronic diarrhea, and weight loss in patients with Acquired Immune Deficiency Syndrome (AIDS). Many MCT products can be found in local health food stores or ordered through pharmacies. Before purchasing these products, patients should consult their doctors or registered dietitians for advice concerning appropriate dosage and use. MCT oil is not used for cooking. However, it can be used for tube feeding in critically ill patients. Healthy people may take it orally, by itself or mixed with water, juice, ice cream, or pudding. People with hepatic encephalopathy, brain and nervous system damage that occurs as a complication of liver disorders, should not take MCT. High consumption of medium-chain triglycerides can cause abdominal pain, cramps, and diarrhea. Long-term high-level MCT consumption is associated with increased risk of heart disease and other conditions. Even moderate consumption of medium-chain triglycerides can increase cholesterol and triglyceride levels. Therefore, no more than 10% of a person’s diet should come from MCTs. Diabetic athletes and those with liver disease should not use MCT products. MCT oil should not completely replace all dietary fats, as this would result in a deficiency of other fatty acids—essential fatty acids— that the human body needs from food sources. To avoid essential fatty acid deficiencies, a person should also include omega-3 and omega-6 fatty acids in their diets. Good sources of omega-3 include fish, fish oils, or flaxseed oil. Omega-6 fatty acids are often found in vegetable oils and evening primrose oil . The omega-3 fats have several additional health benefits, such as alleviating inflammation and protecting the body against heart disease. A person should not take medium-chain triglyceride products on an empty stomach, as this may cause gastric upset. MCT oil is not for cooking. It is usually consumed in its uncooked form as sport bars, or mixed with a carbohydrate drink, protein shake, or other products. MCT oil leaches into plastic bags and containers. Therefore, non-plastic containers should be used for MCT oil storage. There are a few adverse effects associated with MCT use. Eating foods containing medium-chain triglycerides on an empty stomach often causes gastrointestinal upset. Regular consumption of MCTs may increase cholesterol and triglyceride blood levels. There have been no reported interactions between MCTs and other drugs.